Leonardo Da Vinci is widely considered to be one of the greatest painters of all time and perhaps the most diversely talented person ever to have lived. Leonardo was a true renaissance man being a polymath, which is a person, with superior intelligence, whose expertise spans a significant number of subject areas. He was a scientist, mathematician, engineer, inventor, anatomist, painter, sculptor, architect, botanist, musician and writer. Already at an early age he was very talented in different areas. Leonardo liked to play the lute, singing and reading poetry. But it was not these skills he developed the most and became famous for later in life. At the age of 15, Leonardo Da Vinci became an apprentice and was educated in the studio of the renowned Florentine painter Andrea del Verrocchio who he assisted in his paintings. His first known work he painted as an assistant was the angel kneeling on the left of Verrocchio's painting "The Baptism of Christ". The fact that he assisted Verrocchio on several paintings has been the cause of different opinions of who really is the originator of the paintings. In his mid 30:s, he started on a huge range of scientific studies, botany, anatomy, medicine, architecture, military engineering, geography and many, many other subjects. He has left behind an enormous amount of drawings and sketches from that period. 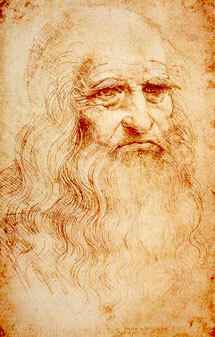 At the age of 61 Leonardo moved to Rome. At this time Raphael and Michelangelo were also working there, but Leonardo had little direct contact with them. Four years before he died he was commissioned to help with the peace negotiations between the French King Francis I and Pope Leo X. Later the French king invited Leonardo to live at the castle Clos Lucé (Cloux) in France and that’s also where he died. Leonardo’s personal life is not so well known as he kept most of it very private. He seemed to have had very few close relationships with women and never got married. He did have two long lasting relationships with men in his life and it is believed he was homosexual. Leonardo is widely considered to be one of the greatest painters of all time and perhaps the most diversely talented person ever to have lived. The Mona Lisa and The Last Supper are his most famous paintings.